Messi and Mascherano, the last two Barça players to debut in Brazil, ready to go for Argentina. The two Argentinians will be the last two Barça players to make their 2014 World Cup debuts when Argentina take on Bosnia on Sunday night. Ten of Barça’s 12 players at the World Cup have made their debuts – with mixed fortunes – and Messi and Mascherano are due to begin their tournament at 11.00pm CET on Sunday, when Argentina take on Bosnia in Rio. Neymar has made a great start, with his brace against Croatia and Alexis also scored in Chile’s 3-1 win over Australia, but it was a rather grimmer start for Barça’s five Spanish players and Alex Song, whose Cameroon side lost to Mexico. There were plenty of long faces as Spain began preparations for Wednesday’s game against Chile and Jordi Alba admitted to the media: “Nobody expected them to score five. We were the better team in the first half, but nothing went right after the break. 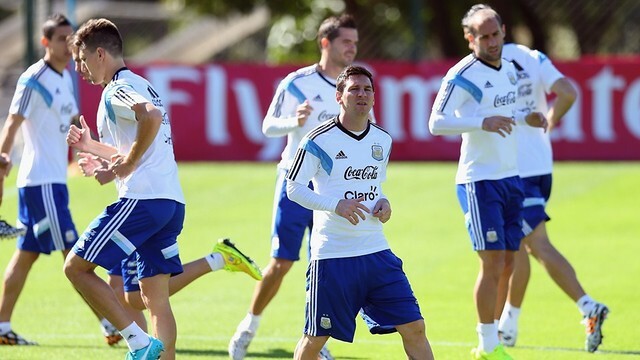 We will have to go all out for a win against Chile – we’ll be giving everything we’ve got to in the match”. Brazil’s next game is on Tuesday, against Mexico and the squad prepared for that match with a practice game against the Fluminense Under 20s for the players who didn’t figure against Croatia, whilst the rest – including Neymar and Alves, trained apart.